One day in the perhaps not-too-distant future you might be able to 3D print a fully functioning PC. 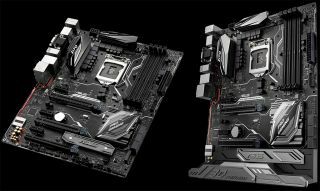 In the meantime, you'll have to settle for 3D printing custom name plates and other accessories for the Asus Z170 Pro Gaming Aura, the first shipping motherboard with patent-pending mounts for 3D printed parts. Asus demonstrated the concept on a variety of modified X99 motherboards at Computex 2016 as part of its "Make It Your Own" 3D printing project, an initiative to take PC modding to the next level. A lot of what can be done is simply for decoration, like custom name plates and decals. But going beyond aesthetics, modders with 3D printers can add things such as cable management solutions and extensions for the audio area. To help spur the creation of 3D printed parts for its motherboard, Asus intends to release a variety of 3D source files. If you strip away the 3D printed aspect of the Z170 Pro Gaming Aura, you're still left with a feature-rich LGA 1151 motherboard. It has four DIMM slots supporting up to 64GB of DDR4-3466 RAM, three PCI Express 3.0/2.0 x16 slots, three PCI Express 3.0 x1 slots, half a dozen SATA 6Gbps ports, M.2 Socket 3, GbE LAN, six USB 3.0 ports, two USB 3.1 ports (Type-C and Type-A), eight USB 2.0 ports, and various other odds and ends. On the audio front, the Z170 Pro Gaming Aura sports SupremeFX technology with a claimed signal-to-noise ratio of 115dB for near-lossless audio quality. This is supplemented with premium Nichicon audio capacitors, shielding against electromagnetic interference, and a 300ohm headphone amp. Asus says the Z170 Pro Gaming Aura will be available soon in the U.K. for £146 including VAT. No word yet on when it will be available in the U.S. and for how much.